New Years Eve here in Melbourne produced a nice opening of FM signals from Queensland. It was a very warm day, so sitting inside a stifling little room wasn’t exactly my definition of fun, but some of the results proved worth it. Despite the fact that I had to pack for a flight to Queensland that night, I spent most of my afternoon by the radio listening and recording these signals. Despite Queensland coming in most summers here in Melbourne, this particular station seems to be a touch rarer. First time reception for me, and as a fan of the music they play on Rebel, I was particularly glad to hear a bit of it. An interesting catch, given that this is a low-powered translator of the AM station from Bourke in north-west New South Wales. Received just after the aforementioned Rebel FM reception. Particularly stoked to grab this one as it’s listed in the ACMA book as only putting out 25 watts. A fairly clear ID comes in at the end of the recording. This clip shows what a real mess this frequency was that day. In addition to the permanent ABC radio station from Bendigo (which can’t even be heard here), two DX signals were fighting it out. The clearest one with the American voices was Hot FM from the Sunshine Coast in Queensland, with the other ad heard suspected to be Rebel FM from Tara, also in Queensland. Nice end to a song with a good promo heard here identifying the station. As a high-powered commercial station on the Gold Coast, this isn’t a hugely rare catch, but still interesting. Caught the start of the news with some good clear IDs. The signal strength was something to note as well. Sadly no clear ID was nabbed here, but I included it as a) I’m 99% sure it was this station (other Rockhampton/Gladstone stations were in at the time), and b) it made a fair effort to get over the permanent local NewsRadio signal from Traralgon that normally sits at 2-3 bars signal strength on the Sony receiver I use. Another first time catch for me. Got a good chunk of the traffic, news and the intro to the first song. All the Brisbane stations were in very well at this stage, as the photo below from Triple M’s sister station B105 will show. The Sony unit I use is notoriously difficult to use for capturing RDS signals. Even on the semi-local stations it tends to struggle to decode the station name and information. 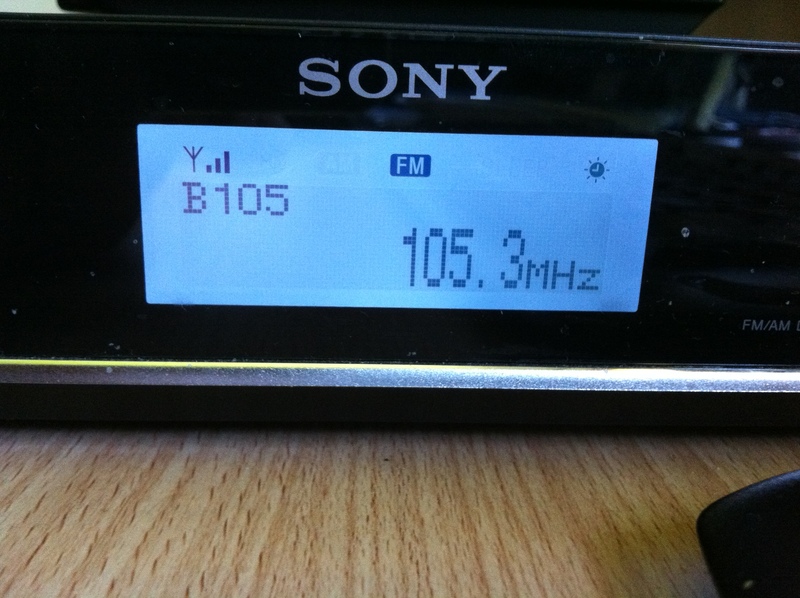 So I was amazed when after a few seconds sitting on 105.3 the unit managed to grab the station name and proudly display it, along with 3 bars of signal. I couldn’t get Triple M or Nova to display their data, but B105 showing up was still pretty impressive. One from the top of the dial, literally. I nabbed Brisbane JJJ on 107.7 before this, but getting Rocky on 107.9 just shows how good an opening this was, nothing on the FM dial was missed. The faint signal in the background is ABC local radio from Ballarat that is only a faint permanent signal where I am due to my shielding to the west. Stupidly, I was too busy mucking around recording to do a proper log, but I can basically confirm that everything between the NSW border and Rockhampton was coming in at at least one point that afternoon. The signals were at times so strong and consistent that I had the portable boom box in the bathroom (the one that can’t even pick up the Geelong stations from here in Clayton) locked on 99.3 4JJJ from the Wide Bay/Bundaberg area, and when I say locked on, I mean barely fading at all for a good 20 minutes. So funnily enough, I was listening to the Queensland stations all afternoon, and by 7PM that night, I was up there myself listening to them again as local stations. Also worth noting that while up there in Coolangatta on the southern Gold Coast, I received a good block of 91.5 Radio Nouveau Caledonie, my first ever non-English speaking nation reception, and only my second international FM reception. I’m led to believe New Caledonia frequently appears in Coolangatta, and I was aided by being in a 14th floor apartment with views directly to the east, but for my little Tecsun unit to nab that made me very happy that day. It even impressed a few of the local folk too. A fairly clear but short MS ping, this one kinda sounds urban. My guess is “The Edge 96ONE” from Katoomba NSW, or JJJ from Lismore NSW. Can’t really be sure though. Even shorter than the first, and also affected by the fact that it had to overcome the blank signal from the local 96.1 that was still broadcasting at the time. My guesses are the same, though this pop piece means Star FM Mt Gambier may also not be out of the question. This one’s a little more developed as it’s not an MS ping – it sounds more likely aircraft scatter (ironic given the lack of aircraft flying in this part of the world at the moment). There are two songs, both by U2 as part of a doubleshot. At about 1:20, there’s an ID which while muffled sounds like it says “suburban doubleshot”. My guesses are Star FM Mt Gambier or perhaps even more likely, 7THE (Radio Hobart) from Tassie. Either way, some interesting results have come in just hours after DXers got the use of this frequency back here in Melbourne. For those who weren’t aware, Jewish community radio station Lion FM, based in the Melbourne CBD, turned off its transmitter today after its temporary broadcast licence expired at midnight this morning. 96.1 Lion FM were on air for about a year, broadcasting from the Melbourne Central tower in the CBD much like Joy 94.9. Their programming was an interesting mix of lost 80s and 90s songs, combined with traditional Jewish music, proving quite an eclectic mix. For some reason, they chose to spend their final four hours on air playing dance music. However, I put up with some of that, and managed to obtain some recordings of their final moments. The first one is of the final speeches given by the on-air staff, and includes the final Jewish song they play before the signal falls silent. This was recorded just before midnight last night (13/06/11). The second one didn’t end up coming until about 20 past 10 AM this morning, when the blank carrier that had been broadcast on 96.1 was finally turned off. This is the transmitter shutdown. After it is turned off, you can hear a DX signal from 96.1 3ABCFM Shepparton VIC, which was semi-permanent into Melbourne prior to the commencement of Lion FM’s broadcast. As a result of recording 96.1 all night, I nabbed some MS pings that I might upload later to get some help in identifying. Sadly they are too short to really get much from though. So now with no local station on 96.1, DXers in Melbourne will be able to nab some rare distant signals on this frequency. Usual suspects include the aforementioned Shepparton station, Star FM Mt Gambier by tropo, and by E-skip: JJJ Lismore NSW and Zinc from Gympie QLD are also quite common in summer. Hope it’s of some interest to you. Enjoy! There’s been precious little DX around here of late, but tonight brought in a few regular suspects at some slightly enhanced levels, plus some slightly more interesting catches via tropospheric ducting. No formal log, but a few little recordings to share with you today. This reception will make some of the seasoned DXers slightly jealous, as TR-FM is notoriously hard to receive here in Melbourne due to it’s reduced power to the west, and the presence of a very strong signal from Geelong on the 99.5 frequency. I’ll admit to being well-positioned here in Clayton in order to receive this station – I’m closer to Gippsland than much of the city, and my antenna is positioned below roof level on the east side of the house, blocking that pesky signal from Geelong out very well. Caught on this recording is the local weather and a nice ID. Much like the last one, this can be difficult to pick up due to Star FM from Bendigo taking this frequency, and coming in incredibly strong over a lot of Melbourne (it was effectively like a local station at my last location in Camberwell). Again, the permanent signal is weaker here, allowing the weaker Gippsland station to come over the top at times. This reception is very weak, and at the end of this recording you hear Star FM fade in over the top. This one is quite common via troposcatter at times here, but today it was sitting at a nice steady if not strong level. 106.5 is probably the strongest and most common of the Albury stations here, with the commercials on 104.9 and 105.7 struggling more. Unfortunately, all that was heard here was Tony Delroy’s “Nightlife” which is heard all over Australia, so there’s nothing really unique to distinguish it. PS – as (bad) luck would have it, just moments after I stopped this recording, I heard an MS ping on this exact frequency. I think it sounded like an Icehouse song, but with the burst of sound being so brief it was impossible to be sure. It could have been Mix 106.5 from Sydney, but again, I don’t know. Why oh why didn’t I keep recording for a bit longer?! This one is permanent reception here, but tonight was particularly strong, nudging 3 bars on the Sony despite my antenna not even aiming at it, and the aforementioned block to the west courtesy of my roof. I posted this because I’ve noticed for some time that 107.1 doesn’t have the same fidelity of sound as most Triple J translators do – it sounds “muffled” if that makes sense. Up until now I haven’t been sure if it was just a poor signal doing that to me, but tonight’s reception has confirmed that it is. I was down in Geelong and unfortunately feeling unwell on Thursday, so I didn’t make it in to work. That proved to be handy from a DX point of view, as I got to enjoy one of the strongest tropo openings to Launceston I’ve seen in a long while. Below is a log of the stations I received (bear in mind this was with the Sony tuner hooked up to the household TV antenna which was pointing the wrong way for Launceston). The Hobart reception was a first for me. Others in Melbourne have received Hobart FM and even TV in the past, but it generally takes a very strong opening to Tassie to get it. I was a bit surprised to not have received any more of the low-powered Northern Tasmania stations, but it didn’t worry me. I should also mention that local analogue TV GTV9 Melbourne was suffering from co-channel interference from TNT9 Launceston, despite our antenna aimed to block out Tassie and specifically receive Melbourne. Later in the evening, thanks to a tip-off from a friend and fellow DXer in Brisbane, I noted some sporadic-E FM reception from Queensland. The opening only really lasted for about 10 minutes after I first got to listening, but I noted most of Brisbane’s high-powered FM stations. 4SBSFM was fighting with 7ABCFM Launceston for the frequency. When 4SBSFM faded, 7ABCFM was heard. 93.3, 106.1 and 107.7 were much stronger than the rest, probably due to them being much higher powered transmitters. Still, it’s the first definite E-skip reception I’ve had this season. I suspected some reception a few weeks back, but couldn’t confirm it. It would have been really disappointing had this not occurred, and the season finished before I had at least heard something. For the record, the E-skip season, especially for FM reception, generally winds up towards the end of January or start of February. I was at the parents’ place in Geelong, and took the Sony XDR-F1HD radio I own with me to have play with. Just hooking it up to the TV antenna socket seemed to work well enough for a number of purposes. The antenna is a multi-band antenna designed to cover all of VHF Bands I, II and III, as well as UHF Band IV, so it would work for FM radio. It’s permanently aimed north-east for reception of Melbourne TV signals, broadcast from Mt Dandenong, east of Melbourne. Worth noting too is that no tropospheric ducting effects were observed during this log. Conditions were as good as completely dead, except for the troposcatter, meaning this is a list of stations permanently receivable at this location. Local services that caused significant spill on adjacent frequencies +- 0.2 MHz either side of designated frequency. 89.3, 93.9, 94.7 and 95.5 were particularly bad. 96.3 and 99.5 were negligible.